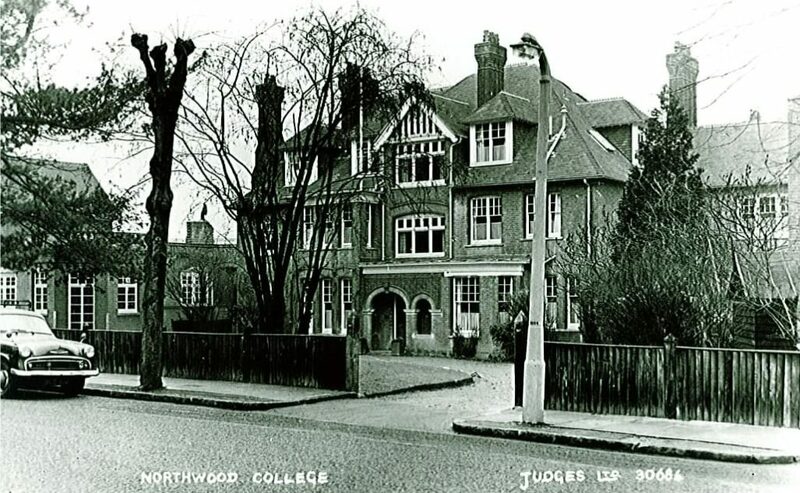 THE COLLEGE BEGAN AS ENDSLEIGH HOUSE NEAR EUSTON STATION, A LONDON SCHOOL FOR GIRLS, FOUNDED BY MISS CATHERINE BUCHAN SMITH IN ENDSLEIGH GARDENS IN 1878, IN AN AGE OF PIONEERS IN GIRLS’ EDUCATION. The school grew quickly and by 1890 was large enough to add a training department for young teachers, but soon after this a decision was made to move to Northwood. In the late 1880s the farm lands around the newly-opened Northwood Station on the Metropolitan Line were being divided up for sale, and a site for the school was acquired in Maxwell Road which, at that time, was a leafy country road with only two houses in its length. The main college building was put up in 1892 and in December the school moved out of London to start the new term in Northwood. There were twenty boarders and a handful of day girls. Within two years of its existence at Northwood a new wing was built to the school, and to meet the needs of a rapidly developing residential area, a department for small boys, the Briary, was later opened in an adjoining house. Boys continued to attend the school 1907. Before the 20th century more buildings had been erected, including a gymnasium in 1899, and the grounds behind the school were set out in tennis and netball courts alongside the hockey field. Miss Buchan-Smith, the founding headmistress, introduced the school motto ‘Education is an atmosphere, a discipline, a life’. The college continued to grow and prosper under Miss Buchan-Smith, who retired in 1911. Miss Hay was headmistress briefly from 1911 to 1913 and during this time the number of girls attending fell. Miss Agnes White was headmistress from 1913 – 1930 and the school developed in size and scope in spite of many shortages and restrictions during the First World War. Northwood began to expand and local pupils were joined by girls from further afield, many starting at the age of five and continuing until they left at 18. It was during Miss White’s period as headmistress that the second school motto ‘Nisi Dominus Frustra’ (without God, we strive in vain) was chosen. Miss Gladys Potts became headmistress in 1930 and during her period she introduced the House System – Buchan, Endsleigh, Briary and White – which continues to this day. Miss Potts also arranged for the school’s first hard tennis courts at the far end of the hockey field. With the support of parents, staff and girls, the gymnasium was lengthened and a stage constructed; this was officially opened in 1936. The gymnasium has played many roles – it has been used for the Kindergarten, third form lessons, singing lessons and in 1994 the library was moved into this building and named the Centenary Library to mark 100 years in Northwood. Miss Potts resigned in 1938 and was succeeded by Miss Worger who remained as headmistress until 1966. Shortly after she took up her post, the school celebrated its Diamond Jubilee with a service held in the gymnasium and attended by a large number of Old Girls. Just before the outbreak of war, Redington was purchased and became the home of the Kindergarten and Transition. Miss Worger steered the school through the Second World War when lessons would be interrupted by sirens and had to be continued in air raid shelters, the staff did nightly fire watching duties and there was a limitation on outside school visits. The Home Guard used the gymnasium every Friday night during this time. From 1959 there was a big expansion of the school both in numbers of girls and buildings. By 1963 in the first phase the ‘Manor’ building (a block of ten new classrooms) was brought into use and two science laboratories have since been added. The second phase of re-building was completed in 1967. In 1965 Wray Lodge was acquired and in 1966 just before Miss Worger retired, the building of the Hall began and was completed in time for the first speech day of her successor, Miss Hillyer-Cole. The Assembly hall was opened in 1967 by Lord Wolfenden. The Centenary of the school was marked by events during the summer term of 1978 which included a Thanksgiving Service held at St Martin-in-the-Fields. Miss Hillyer-Cole commented at Speech Day in 1967. How the school ‘still carried out the aims and ideals of its foundress Catharine Buchan-Smith’. In 1985 Miss Hillyer-Cole established a Work Experience week for girls after completing their O levels. This provided them the opportunity to help them with their career decisions. Miss Dalton succeeded as headmistress 1986 – 1991 and in her time at the school worked vigorously to promote the school as well as improving facilities and extending the junior school. The Boarding House closed in July 1990 as the demand for day places was increasing rapidly and at the same time the demand for boarding places was dropping. Mrs Mayou became Headmistress in 1991 and during her time at Northwood College (1991 – 2002), the new Sports Centre was opened and the current look of the school began to take shape. January 1993 marked 100 years in Northwood and was celebrated with a series of events. The old gymnasium was converted into the new Centenary Library and opened in October 1994. The new Junior School opened in March 1996 and brought a further increase in pupil numbers. Miss Pain was headmistress from January 2009 until August 2018 and during her time, there were numerous innovations and developments including plans for refurbishing of the Centenary Library and the construction of a temporary science block to enable planning and development of a new building. In September 2014, Miss Pain oversaw the merger of Northwood College with Heathfield School to form Northwood College for Girls, becoming part of the Girls’ Day School Trust (GDST). Mrs Hubble became headmistress in September 2018 and plans for a new science and sixth form building were unveiled, and the refurbished Centenary Library completed. The school has survived and prospered across 3 centuries and has been steered through 2 world wars, 6 kings and queens, 35 Prime Ministers, 11 Headmistresses and three London Olympics. In the 1926 school magazine Miss Buchan-Smith wrote that ‘it is a great satisfaction to me to hear of the improvements that have been carried out, and of the recognition’s and successes that have been achieved’. Past and present staff and girls would agree that this can still be said of Northwood College for Girls’.